By all appearances, Sophia D. is the model of a successful student. A senior at an Ivy League college, she has maintained a grade-point average of 3.75 while working 10 hours a week, joining a sorority and running regularly. She carries herself with a subtle swagger that suggests confidence without arrogance, competence without hubris. She seems poised to conquer the world. She assumes that her classmates are more intelligent and better prepared, and avoids participating in class discussions if possible to keep her perceived ignorance to herself. To avoid what she assumes will be inevitable failure, she studies well before exams, writes multiple drafts of papers, and postpones socializing until her work is completed. She’s been able to manage her anxiety well enough through college—though sleeping soundly remains difficult—but applying for jobs has been draining. Sophia has poured herself into the interviewing process, applying willy-nilly to jobs she knows little about and has little interest in because she believes her peers are more attractive applicants and worries that no one will hire her. Self-doubt has been a defining feature of her life since high school. “It’s really rather exhausting,” she said. According to social scientists, a self-doubting mindset leads to two common coping mechanisms: “self-handicapping”—when students underperform as a way to shield themselves from the psychic consequence of working hard and doing poorly—and “subjective overachievement,” taking heroic measures to guarantee a successful outcome, and attributing that success solely to effort. The overachieving variant of self-doubt, which afflicts Sophia, is common among high school and college students, said Patrick Carroll, an assistant professor of psychology at Ohio State University who studies the problem. “Many kids experience it,” he said, though many find a way to conceal their anxiety. “You may know a ton of subjective overachievers and never appreciate their internal struggle and turmoil,” he added. Self-doubt among students is prevalent today for two broad reasons, Carroll said. American culture, for one, places a premium on talent, which is rooted in the belief that success is a function of innate ability: Those born with natural talent are the select and privileged few. To gain favor, individuals have to demonstrate their innate competence. “Teachers and parents monitor SATS, achievement tests and grades as indicators of natural ability,” Carroll said. Fast-moving social changes also contribute to widespread self-doubt. The rate at which people change jobs, and move, and upend their daily lives provokes uncertainty. Though common, relentless suspicion about one’s abilities corrodes confidence and limits learning, even when that anxiety produces successful outcomes, as it does with subjective overachievers. “The emotional drawbacks are intense,” Carroll said. Stress, anxiety and health problems associated with spikes in cortisol levels are byproducts. Some amount of self-doubt is healthy and normal, Carroll added. Indeed, some have argued that the complete absence of self-doubt is associated with a lack of self-awareness and incompetence. “Those with extremely low levels of self-doubt may be the lowest achievers of all,” he said. What’s vital is for students to gain a sensible perspective on their abilities so that every assignment and challenge isn’t a referendum on their worth. Parents and teachers of self-doubting kids can take steps to help buoy these students’ well-being. Change the meaning of doubt. To start, students prone to subjective overachievement can work on changing their mindset toward the experience of doubt. Ordinarily, the first stabs of worry about an assignment can provoke internal questioning: Students think that if they’re feeling doubtful about their ability to tackle a project, say, then the work must not be for them. “It signals ‘I’m not good at it,’ ” Carroll explained. Students need to be reminded that doubt is a normal emotional response to a challenge rather than an indication of incompetence. “They should see doubt as a natural and normal sign that they’re on the path towards pursuing something worthwhile,” Carroll said. 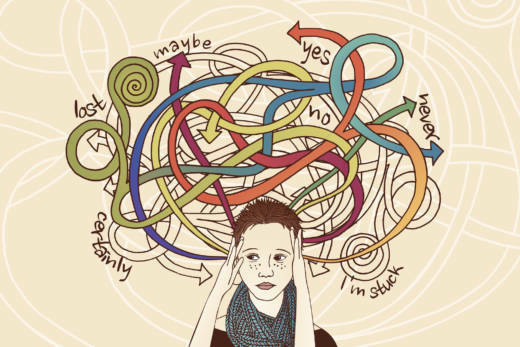 Just as a tough workout in the gym might result in sweating and sore muscles, a difficult intellectual challenge should involve mental struggle and uncertainty. Changing young persons’ minds about how they think of themselves is especially hard for self-doubters, because altering the way they think and behave would seem to threaten what is intrinsically working—in Sophia’s case, her high achievements. But working to alter an unforgiving self-perception is essential to avoid long-term psychological consequences, such as shame, Pardo said. Step back in time. University of Pennsylvania professor and author Adam Grant offers this advice to restless, never-happy strivers: Remember how you felt years ago before having achieved what you’ve now mastered. “Compare your current accomplishments to your past expectations,” Grant advised in a newsletter, “and for a few minutes, before you’re jolted back to the present, you’ll feel contented.” While not eliminating corrosive self-doubt, dwelling briefly in the past can provide short-term peace. Focus on process rather than results. Teachers and parents can also shift from “person praise” when a child performs well to “process praise”: Rather than praising a child for being smart when she receives an "A" on a paper, acknowledge her effort and attention to the process of writing it. Zeroing in on the learning steps the student took to achieve a positive outcome reinforces the idea that subjects can be mastered with work. “If you can learn the procedures, you can do anything and do it well,” Carroll advised. This focus on process enhances learning and soothes emotional distress, while chipping away at the notion that innate ability determines all.